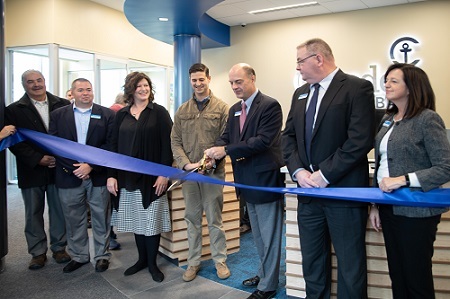 Camden, Maine, November 5, 2018 – Camden National Bank held an official Ribbon Cutting Ceremony to celebrate the opening of their new banking center at 150 Main Street in Waterville, Maine. The new 3,500 square-foot banking center is located on the ground floor of the Bill & Joan Alfond Main Street Commons, at the corner of Main and Temple Streets. Camden National Bank’s previous location at 33 Main Street was purchased by Colby College earlier this year. At the event, Camden National Bank also presented a $2,000 donation to local nonprofit Waterville Creates!, which promotes, supports, and grows the community‘s arts and cultural assets in order to strengthen Waterville as a vibrant creative center, increase access to creative opportunities for residents and visitors, and advance community and economic development goals. In conjunction with the grand opening, Camden National Bank is holding a Customer Appreciation Week from November 5th through 9th at their Waterville Main Street, Waterville Kennedy Memorial Drive, Oakland and Augusta Civic Center banking centers. That week at those locations, the Bank will offer a special CD rate for customers, and they will also be donating $1 per transaction, up to $2,500 total, to a local homeless shelter. Camden National Corporation (NASDAQ:CAC), headquartered in Camden, Maine, is the largest publicly traded bank holding company in Northern New England with $4.2 billion in assets and nearly 650 employees. Camden National Bank, its subsidiary, is a full-service community bank founded in 1875 that offers an array of consumer and business financial products and services, accompanied by the latest in digital banking technology to empower customers to bank the way they want. The Bank provides personalized service through a network of 60 banking centers, 71 ATMs, and lending offices in New Hampshire and Massachusetts, all complemented by 24/7 live phone support. Greenwich Associates named Camden National Bank a 2018 Greenwich CX Leader in U.S. Retail Banking, a designation that recognizes top U.S. banks in customer experience. In 2017, Camden National Bank received the “Lender at Work for Maine” Award from the Finance Authority of Maine. Comprehensive wealth management, investment and financial planning services are delivered by Camden National Wealth Management. To learn more, visit CamdenNational.com. Member FDIC.